Preface Michael D. Bordo, Oyvind Eitrheim, Marc Flandreau and Jan F. Qvigstad; 1. Introduction Michael D. Bordo, Oyvind Eitrheim, Marc Flandreau and Jan F. Qvigstad; 2. The descent of central banks (1400-1815) William Roberds and Francois R. Velde; 3. Central bank credibility - an historical and quantitative exploration Michael D. Bordo and Pierre L. Siklos; 4. The coevolution of money markets and monetary policy, 1815-2008 Clemens Jobst and Stefano Ugolini; 5. Central bank independence in small open economies Forrest Capie, Geoffrey Wood and Juan Castaneda; 6. Fighting the last war - economists on the lender of last resort Richard S. Grossman and Hugh Rockoff; 7. A century and a half of central banks, international reserves and international currencies Barry Eichengreen and Marc Flandreau; 8. Central banks and the stability of the international monetary regime Catherine Schenk and Tobias Straumann; 9. The international monetary and financial system - a capital account historical perspective Claudio Borio, Harold James and Hyun Song Shin; 10. Central banking - perspectives from emerging economies Menzie D. Chinn; 11. The evolution of the financial stability mandate from its origins to the present day Gianni Toniolo and Eugene N. White; 12. Bubbles and central banks - historical perspectives Markus K. Brunnermeier and Isabel Schnabel; 13. Central banks and payment systems - the evolving trade-off between cost and risk Charles Kahn, Stephen Quinn and Will Roberds; 14. Central bank evolution - lessons learnt from the sub-prime crisis C. A. E. Goodhart; 15. The evolution of central banks - a practitioner's perspective Andrew G. Haldane and Jan F. Qvigstad; Index. 'Economic policy makers - just as generals - tend to fight the last battle rather than the one at hand. Instead they should learn from history and try to find fundamental underlying principles that can guide policy. For those with an interest in monetary policy and the task of a central bank Central Banks at a Crossroads is a good start.' Lars Heikensten, former Governor of Sveriges Riksbank, Executive Director of The Nobel Foundation 'How do societies remember? How are events that occur repeatedly, but that are separated by large gaps of time like financial crises, to be dealt with if every generation wants to learn their own lessons? This important volume argues that the history of central banking and central banks in practice holds out the possibility of creating two institutional attributes crucial for effective public policy: memory and patience. Casting a wider scope than monetary and banking history, the chapters suggest new ways of thinking about the role of central banks and their interaction with economies, polities, and societies.' John Joseph Wallis, University of Maryland 'This book makes for fresh reading at an important juncture, as the economic recovery weakens, while some central banks begin to exit from unprecedented crisis-response policies. We live in unchartered territory, and it helps to gain a better historical perspective of central banking and the challenges these institutions face. This book should provide the basis for debate and the development of next-generation central bank policies.' Angel Gurria, Secretary-General of the Organisation for Economic Co-operation and Development "Economic policy makers - just as generals - tend to fight the last battle rather than the one at hand. Instead they should learn from history and try to find fundamental underlying principles that can guide policy. For those with an interest in monetary policy and the task of a central bank Central Banks at a Crossroads is a good start." Lars Heikensten, former Governor of Sveriges Riksbank, Executive Director of The Nobel Foundation "How do societies remember? How are events that occur repeatedly, but that are separated by large gaps of time like financial crises, to be dealt with if every generation wants to learn their own lessons? This important volume argues that the history of central banking and central banks in practice holds out the possibility of creating two institutional attributes crucial for effective public policy: memory and patience. 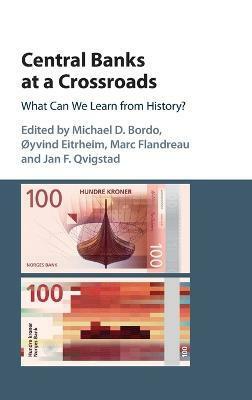 Casting a wider scope than monetary and banking history, the chapters suggest new ways of thinking about the role of central banks and their interaction with economies, polities, and societies." John Joseph Wallis, University of Maryland "This book makes for fresh reading at an important juncture, as the economic recovery weakens, while some central banks begin to exit from unprecedented crisis-response policies. We live in unchartered territory, and it helps to gain a better historical perspective of central banking and the challenges these institutions face. This book should provide the basis for debate and the development of next-generation central bank policies." Michael D. Bordo is Professor of Economics and Director of the Center for Monetary and Financial History at Rutgers University, New Brunswick. Oyvind Eitrheim is a Director at the Governor's office, Norges Bank, Oslo. Marc Flandreau is a Professor of International History at the Graduate Institute of International Studies and Development in Geneva. Jan F. Qvigstad is the Executive Director of Norges Bank, Oslo.